While unbelievers may pursue a myriad of diversions and pleasures, a Christian's unique goal should be God Himself. God created us for Himself, and He wants to be the unrivaled object of our pursuit: "Seek the LORD and his strength, seek his face continually"; (1 Chron. 16:11). In contrast to this intention, however, many Christians do not have a consistent pursuit. 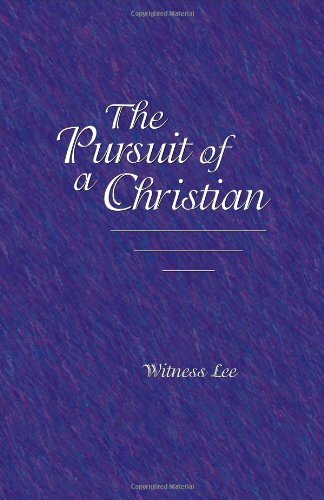 In The Pursuit of a Christian Witness Lee guides believers back to the center of the Christian life. Using practical illustrations, he presents the normal life of a believer. A Christian should possess and enjoy four indispensable items: Christ, the Bible, the church, and spiritual companions who pursue after Christ. He also should have four distinguishing characteristics: he should be peculiar to unbelievers because his manner of life is sanctified; he should be inwardly aware that the Lord's leading often is in contradiction to his personal desires; his living should originate from his innermost part rather than from his natural considerations; and he should seek the will of God and be led by God in everything he does.